Scotland Women are no longer "in awe" of the game's top players, insists captain Rachel Corsie. The centre-back, 29, is a club-mate of USA captain Becky Sauerbrunn, "one of the best defenders in the world". She will face another Utah Royals colleague in Gunnhildur Jonsdottir when Scotland meet Iceland in their second Algarve Cup match on Monday. "A lot of the girls now have a good understanding of players from all over the world," Corsie told BBC Scotland. "I've played with Gunny now for a year, she's an incredible athlete. It helps you to be confident when you go into these games as you have a better understanding of them and you don't need to be in awe of them anymore. "We understand that we're on the park to compete with them for a reason and we're good enough to do that." 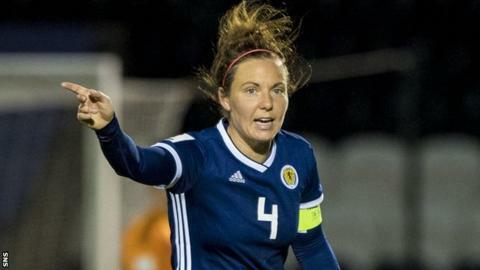 The experienced defender has played back-to-back seasons to prepare for her - and Scotland's - World Cup finals debut in June. Corsie spent her Utah off-season leading Canberra United in Australia's W-League and says this is "the fittest I've ever felt". "It was important that I was in an environment where I was playing competitively over the off-season in the US league," she added. "In the past I've taken time off, gone home and trained myself and I felt that in this particular instance it was best to continue playing, and while you're fit and fresh there's no better feeling than keeping on going." Shelley Kerr's side lost their opening match in Portugal 1-0 to Canada. Monday's opponents sit two places below Scotland at 22nd in the world rankings and have failed to qualify for the finals in France. "These are the games now that as we move up the rankings and qualify for these tournaments we need to understand that the expectation on us changes and that we have to consistently perform and get results in," Corsie said.